Plymouth Devils admit they never expected Danish World Cup-winning teenager Mikkel Bech to stay with the Premier League side. Bech, 18, has agreed a deal with Elite League club Lakeside for next season. "We always knew that Mikkel's long-term future was not with Plymouth," Devils co-promoter Ashley Taylor said. "He gained a good apprenticeship with us in the Premier League last season while making a few guest appearances in the Elite League." Bech, who joined Plymouth when they were second-from-bottom in the Premier League in May, made an instant impact on his arrival, winning on his debut. He went on to become the Devils' number one rider. Taylor said compensation for Bech's transfer will help secure the Devils' future. "Mikkel is a Plymouth asset, so we will be negotiating a transfer figure with Lakeside, which means we will get something back from our efforts to help build a stronger financial base for Plymouth Speedway with a view to our long term plans," Taylor said. The Devils have already named four of their seven starting riders for the forthcoming season, with Great Britain international Ben Barker re-joining the club. 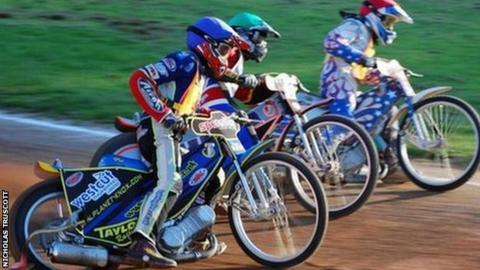 Plymouth have been drawn against Redcar in the first round of the Premier League Knock-Out Cup and have been grouped with Somerset, Rye House and Ipswich in the opening stage of the League Cup.